MJR Theatres: FREE Movie November 11 when you donate! and see the MOVIE OF YOUR CHOICE FREE! All donations benefit Gleaners Food Bank. Donate Kroger brand canned items and Kroger will match your donation! Free movie offer redeemable on Wednesday, November 11 from 4 p.m. to 10 p.m. only. Get a list of shows and show times by visiting MJR Theatres online. Visit any one of the six participating locations: Brighton, Chesterfield, Clinton Township, Southgate, Sterling Heights, or Waterford. Thanks, Courtney! Ebay: Disney PJ Pals for $5 shipped today only! Disney is offering 5 different Official Disney PJ Pals through Ebay for $5.00 each today (November 9) only. These are available as a Buy It Now item with FREE SHIPPING in sizes 2-12 (while they last – they’re disappearing quickly!) Another GREAT Christmas gift idea – at a bargain! Click on the Ebay link through Ebates and you’ll earn 2% back on your purchase! 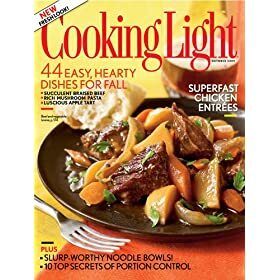 Some magazines are RARELY available at a discount, and Cooking Light is one of them. You’ll find it NOW (reduced for only one week, through Saturday at 11:59 pm) for only $5! This would make an excellent gift for your favorite food enthusiast (or a treat for yourself)! Cooking Light is full of healthy recipes, cooking techniques, tips and tricks (and occasionally, coupons!). Remember: Magazine subscriptions always ship free, and they help you qualify for FREE Super Saver Shipping on the rest of your order! Right now, you can find the LeapFrog DVD: A Tad of Christmas Cheer for only $3.86 at Walmart.com (it’s priced $9.98 at Amazon) . Add it to your cart and select site-to-store for in-store pick-up (and no shipping charges)! My kids received this for Christmas last year and have watched it throughout the year! It follows the lines of “It’s a Wonderful Life” for kids. You can read a description, review and more details here. It would make a great gift or stocking stuffer for kids ages 3-6. Click here to purchase A Tad of Christmas Cheer from Walmart.com. Thanks, The Coupon Scoop! Not to be outdone by KFC’s free grilled chicken offer yesterday, Boston Market is offering a $1 Real Chicken Meal with coupon through November 1, 2009 (valid on quarter white or 3 pc dark chicken with mashed potatoes and cornbread). Print a coupon here (thanks, Colleen!). Good only at participating locations. Coupon is valid for one Real Chicken Meal per person, per visit. Not valid with any other offers; applicable taxes still apply.